Note: This will leave you with extra supplies (drip tubing, supply line, etc) that you can use for other drip projects in your yard. So make sure to buy a bunch of fittings! I keep my extra fittings in a little plastic part box. If this is your first time working with drip irrigation allow 60-90 minutes to install a system of this size. As you get more used to working with drip supplies it will go quicker. 1. Decide you the layout of your irrigation. If you have emitters every 6″ you will want to space the lines 6″ apart so there is even water coverage over all the soil. Set up your raised beds and fill with soil. In this case I used (4) Woolly Pocket Lil’ Meadows. 2. Insert stakes into soil every foot or so where you plan to run drip line. Starting at one end of bed snap drip line into stakes and continue across bed snapping the drip line into the stakes. At end of line cut tube with scissors. Repeat for each row. Push End Plugs (Goof Plugs) into the end of the drip line furthest away from the water source. 3./4. Once all the drip lines are in place you will need to connect them with drip supply line (tube with no emitters). Use “T’s” & “L’s”. The fittings will be somewhat difficult to push into the drip line as it needs to be very snug. I like to use the tip of a stake to stretch out the opening of the tube so that the fitting slides in easier. Another trick is to heat the end of the tube with a lighter to temporarily soften the plastic. 5. Run a longer section of drip supply line (no emitters) to your water source. For a simple connection to a spigot (that you will manually turn on) attach a 3/4″ Female Pipe Thread (FNPT) Adapter with Washer x 1/4″ Compression to the supply line and screw on to spigot. Super easy. If you want to add an Irrigation Controller/Timer, mount it to the spigot. Add a pressure regulator (if it isn’t already built into the timer) and then connect the 3/4 Female Pipe thread. Also pretty easy. 6. Test the irrigation. Let it run for 20+ minutes and observe the moisture pattern. Confirm that all the fittings are snug and that water is being delivered where you need it. Adjust location of stakes as needed. Once everything is working properly you can get busy planting! 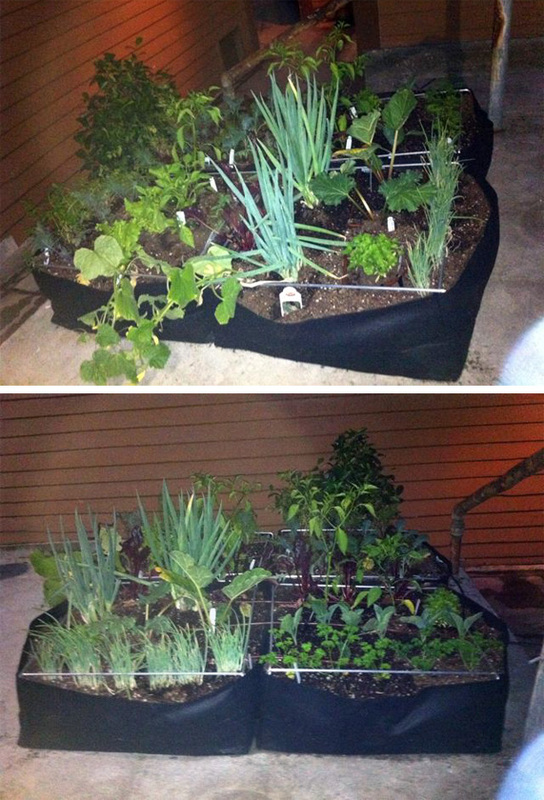 I installed these raised beds in August 2011 and planted them with fall starts from Sunset Nursery in Silver Lake. In the photo below we have lettuce, onions, chives, parsley, cauliflower, rhubarb, carrots, cucumber and a couple of pepper plants. 6 weeks after planting –the fall garden really thrived with drip irrigation.